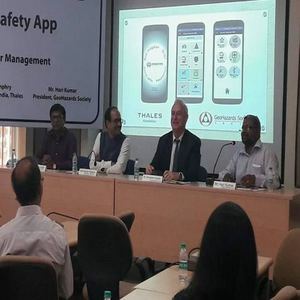 Thales Foundation and GeoHazards Society (GHS) today announced the nationwide launch of a first-of-its-kind School Safety Mobile Application that will allow school administrators to ‘write’ a School Disaster Management Plan (SDMP). The Android-based app was launched by Mr Kamal Kishore, Member, National Disaster Management Authority (NDMA), Prof Santosh Kumar, Executive Director, National Institute of Disaster Management (NIDM), and Mr Christophe Humphry, Chief Operating Officer, Thales in India, and Mr Hari Kumar, President, GeoHazards Society, at NIDM headquarter in New Delhi. Over the years, Thales has been supporting various NGOs in India through local CSR initiatives and also group-level Foundation efforts. Some of them include Kutumb Foundation, Jagriti, Protsahan, Samarpan Foundation, among others.